Each year, the Transportation Research Board (TRB) Standing Committee on Traffic Control Devices (AHB50) and the American Traffic Safety Services Association (ATSSA) join together to sponsor and conduct an exciting design competition, the Traffic Control Device (TCD) Challenge, to promote innovation and stimulate ideas in the traffic control devices area with a goal to improve operations and safety. This year, twenty four teams from around the country participated, one of which was a group of four students from Oregon State University (OSU). The top nine teams were invited to give live poster presentations during the 97th TRB Annual Meeting in Washington D.C. this past January. Here, thirty judges walked through the posters where students from each team gave short presentations of their work. The top three teams were then invited to the ATSSA Annual Convention and Traffic Expo to present their work. 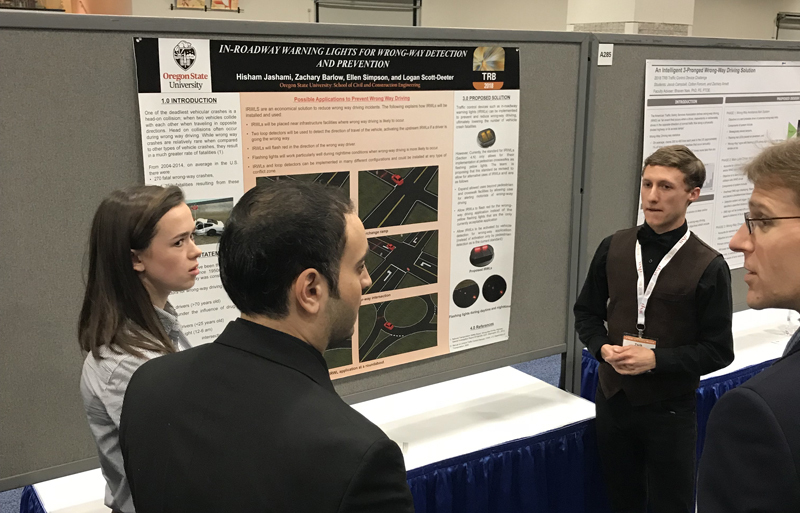 The OSU student team was not only invited the present at the TRB Annual Conference, but places 2nd and was further invited to the ATSSA Annual Convention and Traffic Expo in late January in San Antonio, Texas, where they presented their work. “Wrong-way driving can be described as a situation when a vehicle enters a traffic stream travelling in the opposite direction and drives against the on-coming vehicles. These events continue until the operator realizes he/she is in error, leaves the roadway, redirects her/his vehicle to the proper direction, or causes a collision. This behavior results in hundreds of highway fatalities every year.